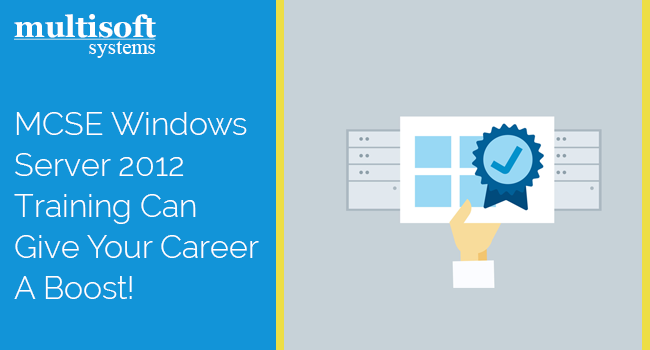 MCSE Windows Server 2012 Training Can Give Your Career A Boost! Microsoft Certified Solutions Expert (MCSE) Certifications enjoy high recognition in the IT industry. The employers prefer candidates having these certifications over general degree holders. This is because the MCSE certifications and courses equip you with practical knowledge and prepare you for the industry. They also make you learn important concepts and validate your skills and expertise through the certification process. MCSE Windows Server 2012 Training is a highly sought-after and valued certification in the industry that has the capability to boost your career. The MCSE Windows Server 2012 Training makes you eligible for getting the positions such as network administrator, computer administrator, and a computer network specialist. It provides the skills and knowledge to an individual to successfully manage the IT infrastructure of an organization. Besides those mentioned above, there is a whole lot of learnings and benefits from the MCSE Windows Server 2012 course that could not be listed here due to the paucity of time and space; that’s why we have listed the primary ones. Many students and professionals have brightened their career prospects through the above training; you may also enroll in it and got the benefits. However, you should take care to pursue this training from a reputable Microsoft partner organization only that has a proven track record. Best of luck! How well does Microsoft Azure transform business functions and processes? Why MCSE Windows Server 2012 training is Essential for a Computer Support Specialist?